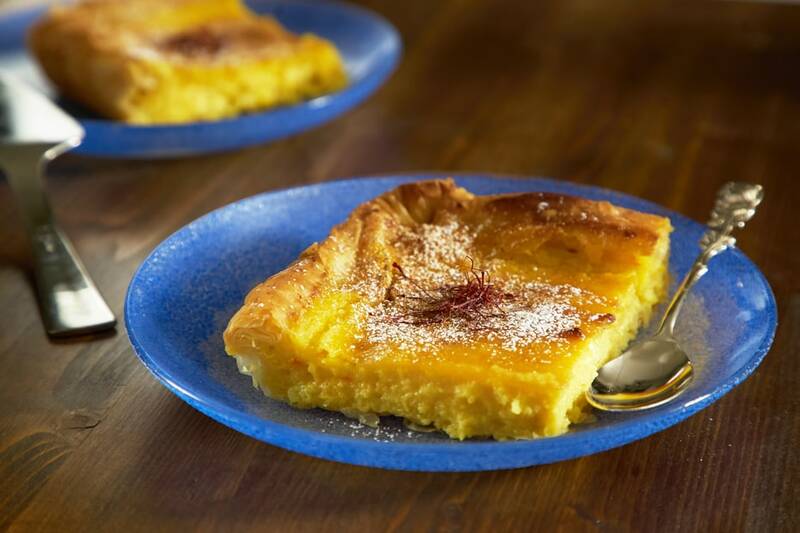 Milk pie, galatopita, is one of the most elegant, sumptuous, and seductive Greek recipes. 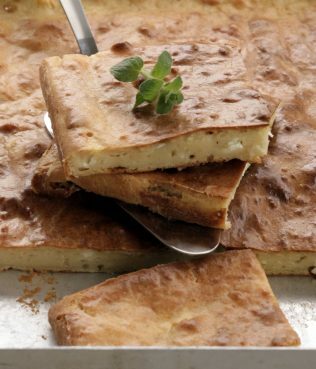 Most galatopita recipes hail from the mainland and northern parts of the country. Heat the milk and sugar together over low heat in a medium saucepan. When the mixture starts to simmer, remove from heat and set aside. In a large mixing bowl, preferably stainless steel, combine the semolina, cornflour, and salt,. Add the eggs to the dry mixture, whisking until smooth, thick and pasty. 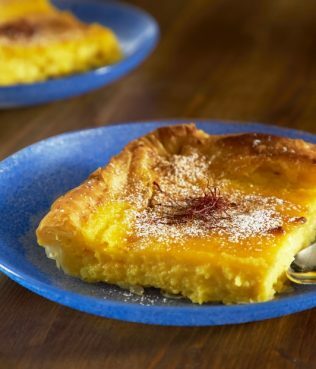 Whisk in the vanilla, saffron, lemon zest and one cup of the warm milk-sugar mixture to temper the mixture. Add the remaining milk-sugar mixture and place on the stovetop over low heat, whisking continuously, until it thickens. Be careful not to let the mixture burn on the bottom of the pot. When the mixture is thick, add the butter, whisking until it melts. Lightly butter a 12-inch round X 2-inch deep pan. 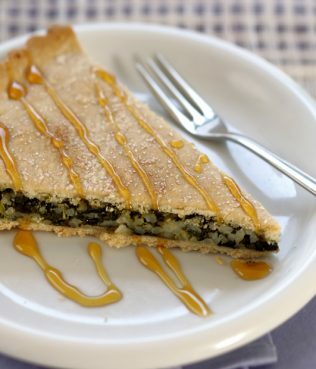 Layer the phyllo, one sheet at a time, brushing each with melted butter. Overlap the sheets concentrically so that the overhanging phyllo looks almost like the points of a star. Pour the filling into the pan over the phyllo. Turn in the overhanging edges to form a ring. Alternatively, layer the phyllo in a rectangular pan, folding in the edges to form a rim once you’ve poured in the filling. Whisk together all the ingredients for the topping and pour this over the surface of the milk pie. Bake the pie for 40 - 45 minutes. Remove, cool, and sprinkle with confectioner’s sugar and cinnamon. Serve.